Every year, we try to give you something extra special around the holidays. This year, we thought it’d be fun to offer something that will make your skin care routine more a sensory experience, while also increasing the effectiveness of our products. So we decided to make a signature Annmarie Skin Care face brush! What is a Face Brush? Face brushes have soft bristles and are used to clean your skin. It’s different than dry brushing, which is done all over on, obviously, dry skin. Over the past few years, Clarisonic brushes have become quite popular. These brushes vibrate and help you get a deep clean when you wash your face. A few of us around the office have used them, and we like them. 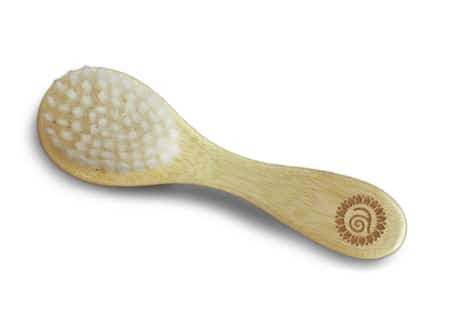 But you can get a similar (if not the same) effect from a simple and more eco-friendly face brush. Clarisonic brushes have to be charged, and are also pretty expensive. Face brushing lightly exfoliates your skin and helps you really massage your cleanser in, giving your pores a thorough clean. They’re also helpful for rinsing off facial masks, like our Coconut Honey Mask. You can pump your cleanser directly onto your face brush, add a little bit of water, then use it to massage the product into your skin. Alternatively, you can put the product onto your skin instead of directly onto the brush. Instead of your fingers, use the soft bristles of the brush to clean your pores. Then rinse off your cleanser as normal. With some moisturizing face masks, like our Coconut Honey Mask and Purifying Mud Mask, a face brush can be helpful for removing it. Once the mask has done its duties, use the face brush to gently slough it off. These brushes are a limited special gift for the holidays! Unfortunately, we will not be selling them on our site. Each time you use your face brush, you’ll want to wash it with hot water. Once or twice a week, you can clean it with a stronger cleaning solution of your choice. So how do we tell the difference between a face brush for cleansing, and a face brush for dry brushing?! Do you mean the one for cleansing? After a couple of uses, at the bottom of the brustles or the brush itself turned a dark brown/black. Is that normal? The brushes are made from untreated bamboo so if they turn dark it just means that it was sitting somewhere wet or it was put away wet. Let our customer support team know at [email protected] and they’ll send you a new brush! I love my face brush. It gives me more coverage than my fingers and I believe that it really does clean better. Plus it’s invigorating. I alternate face cleaning between my brush and the cleanser on one day, the scrub mixed with the cleanser the next day (I use my fingers for the latter). I only use just cleanser and my fingers once/week on my one non-exfoliating day. Hi – I placed an order yesterday, am I eligible for the face brush? Please let me know how I can buy just this. I just placed 2 orders for what I needed…..then the brush appeared.